During the first week of August, Crystal Cove was the setting for another successful Camp Cove, which saw 100 campers from Santa Ana travel to the park for five straight days of fun in the summer sun. The campers, all between the ages of 6 to 17, came from the Santa Ana Police Athletics and Activities League (SAPAAL), a community organization that focuses on building a bond between kids and police officers through education, fitness, and activities. 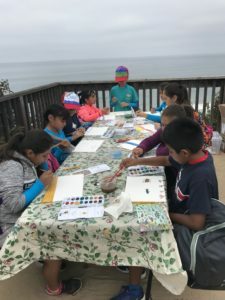 Their week at Camp Cove was organized by the Crystal Cove State Park Lifeguard and Interpretive staff, with help from Crystal Cove Conservancy. Each morning, students started their day by exploring the various components of Crystal Cove’s coastal ecosystem. With the help of Davey’s Locker Sportfishing and Whale Watching, students began their adventure offshore, searching for marine mammals and pelagic birds in the Crystal Cove State Marine Conservation Area. Later in the week, the campers headed down to Moro Canyon and learned about the terrestrial side of Crystal Cove. They had some memorable interactions with some amazing animals, meeting dogs from the State Park’s K-9 unit, feeling various tidepool organisms using Concordia University’s tidepool touch tank, and witnessing the release of an elephant seal and sea lion by the Pacific Marine Mammal Center. Students also hit the trails in Moro Canyon for a nature walk, learning about the local watershed and how it influences the coastal sage scrub community. The campers then spent their afternoons with the Crystal Cove Lifeguards, learning about beach safety, playing games on the beach, and getting comfortable in the water. While the participants live just 12 miles away, some had never experienced the coast. Now, thanks to the support of Massen Greene Foundation and all our Soiree Camp Cove donors listed below, these campers have a full week of Crystal Cove memories. Susan Alexander, Jay Bauer, Dawn and Paul Behnke, Kim Bowen, Chad and Melinda Bustos, Scott and Erin Capobianco, Anita Carr, Joseph and Joyce Cylwik, Dell and Carol DeRevere, Brian Dobbin, Scott and Colleen Elliot, Les and Tina Fields, Warren and Sherry Fix, Patrick and Bonnie Fuscoe, Candace Harrison, Gavin and Kerry Herbert, Mike Ivey, Stephanie Quesada and Vince Jackson, Craig and Jody Johnson, Charlie and Lynda Kinstler, Jill and Stan Littley, Bertie Lowenstein, Kirsten and Tom Minasian, Jim Moloney, Dale and Jana Monroe, Kevin O’Grady and Nella Webster O’Grady, Bob and Christyne Olson, Todd and Natasha Palmaer, Wayne and Karen Pinnell, Andy and Rosanna Rocker, Amanda Salter and Carl Langfeldt, Gerald and Christine Scheck, Hilton and Michelle Schlosberg, Kevin Shepherd, Shaun and Jackie Skeris, Michael Sprague and Shelly Soenen, Eva Tanenbaum, Hunter and Liz Tate, Susan Tate, Shelley Thunen Southard, Rossini and Bill Westlake.